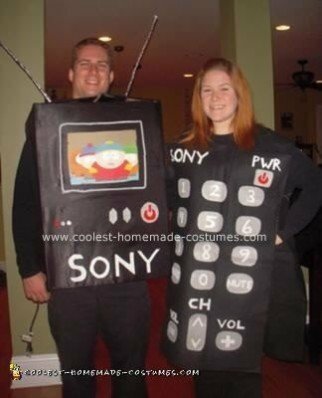 My boyfriend and I love to wear couple costumes and this Homemade TV and Remote Control Couple Costume was by far the best that we have come up with! The TV is made out of a cardboard box, black fabric, felt for the buttons and letters, pipe cleaners for the screen frame, wire hangers and aluminum foil for the antennae. He put a picture from the adult cartoon South Park as the show. The back also has a hole cut out for the cord, and it has the old school style back that sticks out instead of the modern flat screen. My costume (the remote controller) is made out of stiff black fabric, that we had lying around, and felt for the buttons. Everything is attached with felt glue. I also added wire hangers on the inside of the top and bottom so it would hang straight down. If we ever wear these again, I will add a battery compartment to the back of the controller! Everyone LOVED these cool TV and Remote Control costumes. They were a huge hit.